NBC reported that the U.S. National Transportation Safety Board was also sending a team to the scene. NJSP sending multiple assets to #Hoboken train station. We are continuing to monitor the situation. FRA Administrator @FeinbergSarah and FRA's top safety official, Bob Lauby, en route to Hoboken. More video by Reuters reporter Robert MacMillan shot outside HUMC. FRA investigators have arrived on site in Hoboken. 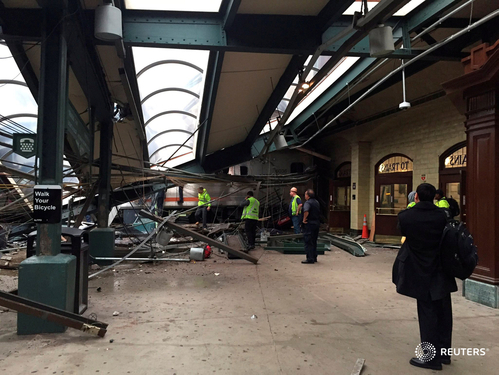 New Jersey Transit employee Michael Larson describes seeing a passenger train come into the Hoboken station at high speed, ''basically through the air'' and come to a rest when it hit the wall of the waiting room. A commuter train plowed into a station in New Jersey at the height of this morning's rush hour, killing at least one person and injuring more than 100 others as it brought down part of the roof and scattered debris over the concourse. 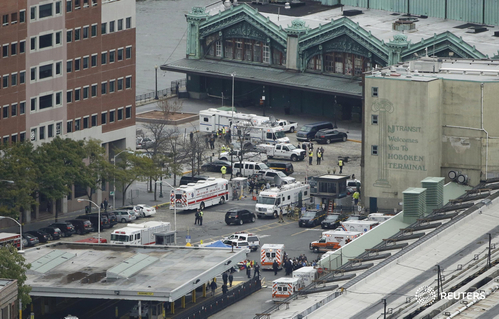 Witnesses described terrifying scenes as the front of the train smashed through the track stop in Hoboken station at high speed and into the terminal, toppling support columns and creating chaos at one of the busiest transit hubs in the New York City area. New Jersey Governor Chris Christie told a news conference in Hoboken that one person was killed on the platform by debris from the crash, and he said 108 people were injured. There were no signs it was anything other than an accident, he added. The train's engineer, or driver, was seriously injured and in a hospital, and was cooperating with law enforcement officials in the investigation, Christie said. "We're not going to speculate about the cause of the accident," he said. New York's Governor Andrew Cuomo told the news conference it was obvious the train had come into the station "at too high a rate of speed," but that it was unclear why. A couple of hundred emergency workers shuttled in and out of the station, some carrying the injured on stretchers to waiting ambulances outside. Dozens of police boats bobbed in the Hudson River alongside the terminal. Accounts from officials at two hospitals said some of the injured were in critical condition. Several passengers were initially trapped in the wreckage, witnesses and officials said, but they were later freed. There was no word yet on what caused the crash. Federal investigators were on the scene. "The one thing we do know is that obviously this train that was traveling at a fairly high rate of speed," Christie said in an interview earlier on Thursday with CNN.